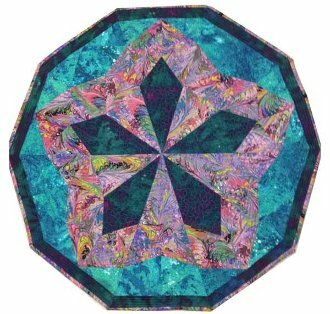 A ten sided shape, new to the quilting world, can be easily accomplished with the NEW Jewel Box tools. The Banded Agate quilt is made with linear fabric. Instructions are in booklet form with full color graphics. So simple to follow--You'll be amazed. Jewel Box tools: Gem Ten and Gem Five are required. Finished Size is 45" x 47".